Enjoy a tote full of tints. Our best-selling Sweet Lips honey lip tints nestled into an adorable reusable emblem tote that fits nicely into even the smallest handbag. Made with 92% organic ingredients and minerals from earth for color. Handmade in the USA. Grab a Tote Full of Tints and always have soft lips in the palm of your hand. We hand-picked our very best selling honey lip tints and packaged them in an adorable tote bag stamped with our emblem. Our lip tints are made with at least 92% organic ingredients. 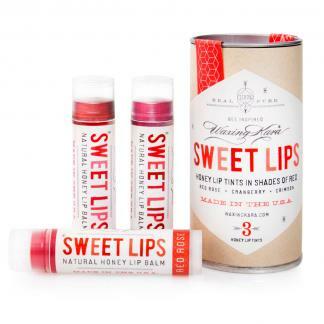 Soothe and moisturize your lips with a blend of plant oils, butters, and honey. All products are made in America and are free of parabens, sulfates, and petroleum ingredients.